Go Back | Go Home | Create an Account | This web site is undergoing a complete HTML 5 / CSS 3 Overhaul. 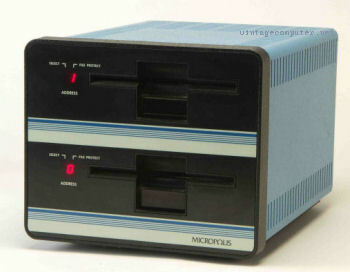 The Micropolis 1033 was a dual single-sided drive unit that attached to a special controller card. The Micropolis system used 16 hard-sector diskettes. 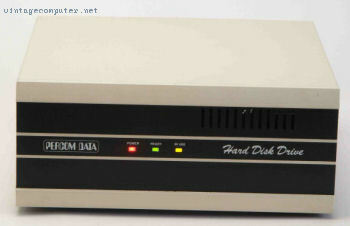 These drives were popular with IMSAI 8080 computer users. NOTE: Double-sided drives had a shiny blue strip on the drive activation button, which is how you can tell them apart..
What was the most popular nonvolatile storage method for microcomputer users in 1977? We're talking about external memory — mass storage — which normally resides separately as a peripheral device, accessible by the CPU only through an I/O port via cable. Hard disk storage? Too expensive. 8" disk drives? Cassette? Nope. The correct answer is papertape, and the Teletype Model ASR 33 was the machine of choice for most microcomputer users at that time. The printout of a papertape listing on a Teletype ASR 33. The primary reasons for the popularity of the teletype were price and reliability. 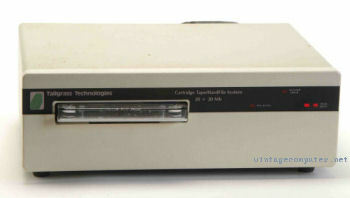 Because the ASR 33 also served as an I/O station and printer it was in effect four devices in one - "display", I/O, storage, and printer. The teletype itself was too heavy to transport conveniently, but papertapes themselves could be stuffed into a jacket pocket and read on another teletype unit or mailed. Magnetic media was more vulnerable to damage. Despite its advantages the Teletype was loud. It was BIG, and it was slow. The equivalent baud rate for the ASR 33 was 110, which is about the same output speed as professional typist. 4 kilobyte programs would take five minutes to load using a Teletype. It was only a matter of time before alternatives to the Teletype would appear. By 1980 cassette tape became a more popular means for mass storage than papertape. Cassettes were the least expensive of the magnetic recording devices. At the time most people already had a cassette player in their homes so they were familiar with the technology. Cassette storage was recorded in serial format with bits made up of audio pulses, essentially the analog to the teletype punch signals. This made it easy for manufacturers to build devices that could use cassette for mass storage. 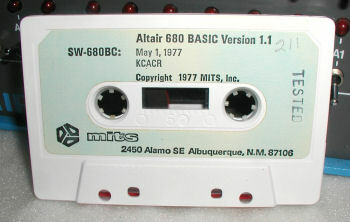 An early copy of BASIC for the MITS Altair 680 computer on cassette tape. In 1977 one could purchase a cassette for $2.25 and have approximately 100,000 bytes of data / tape. The cost of the tape recorder was about $25 - $150, and the computer equipment needed to interface with computer was $100 â€“ 200. There were drawbacks to the cassette. Tapes were recorded serially (one long string), and programs in middle of the tape would have to be searched using hit and miss methods. The cassette was not much faster than a teletype (approx. 300 vs. 110 baud) to load or save files - it took 5 minutes to load a 10K program. Cassette recorders were not solely designed for use as a mass storage system and as a result there were issues with volume settings, uneven tape speeds, unreliable motors, and variability of manufacturer's tape quality. The practical size of the files stored on cassette was limited by the ability of the cassette player's motor to pull a tape at a constant speed and volume. There was a lack of recording, software, and hardware standardization. The most popular method of the early cassette days was called the Kansas City Standard, but there also were competing standards such as the faster Tarbell interface. More sophisticated digital cassette units began to appear on the market but they were expensive, their access time was still slow, and these devices were best used for daily backups not program storage. Compared to cassette storage floppy disks had a number of advantages. Many of the early 8" floppy drive systems had diskettes with a capacity of 256K bytes. Information could be accessed in less than a second regardless of its location on the disk (random access storage), and the transfer rate was up to 30,000 bytes per second (although usually slower). Generally speaking 8" diskettes were divided into 77 tracks of concentric circles and one revolution of the disk, with the head fixed, covering one track. Tracks were divided into sectors. The IBM format contained 26 sectors per track starting at the index hole. The sectors were marked with information recorded on the disk ("soft sectored") or a ring of holes punched in the diskette ("hard sectored"). In 1977 the typical floppy system would cost more than the computer itself. Take for example the IMSAI Floppy Disk System which was reasonably priced for the time. "..The controller has a built-in microprocessor and will handle up to four drives. This is an easy way to get going in a hurry and is priced in kit form at $1449, assembled at $1649, and with two drives at $2374. The disk operating system is available for an additional $40. An extended BASIC with disk access is also supposed to be available. [source Kilobaud March 1977 pg. 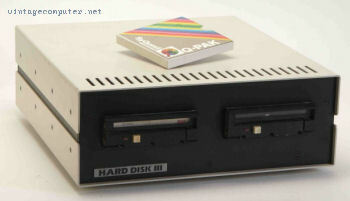 75] .." Manufacturers like Apple and Northstar produced more affordable, albeit lower capacity 5 1/4" disk drive systems. 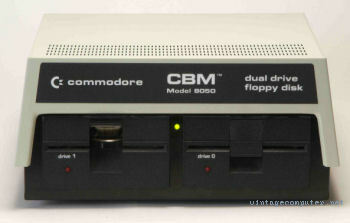 The 1981 Commodore CBM 8050 dual 5 1/4" external disk drive used the 6502 microprocessor and could operate independently from the computer. Small businesses with larger budgets began employing external hard drive systems and the high capacity digital cassette backup drives for mass storage in the late 1970's. External drive systems typically cost more than $5000, making them too expensive for the home user. Hard drive prices finally became affordable for home use in the mid 1980's. The capacity of these early hard drives was typcially 5-20MB. There were few if any internal hard drives in microcomputers in the 1970's. Early hard drives were used as if they were large diskette drives. Popular 70's operating systems like CP/M did not have sophisticated means for storing data on "large capacity" devices. MS DOS 2.0 was the first microcomputer operating system that included a practical method for creating subdirectories for storing files. In the early 1980's Percom PHD series external hard drives were manufactured for use with the IBM PC 5150, before internal hard drives were practical and affordable. The PHD series came in 5, 10, 15, and 20 megabyte models.